The new school year is here, and teachers everywhere are trying to gear-up for the long haul. Every fresh, new start, we hope to create space that will inspire the little minds we teach. Organizing a classroom used by, at the very least, 20 students and keeping it running smoothly without having it look like a tornado hit is no ordinary feat. Sometimes incorporating just quick, little ideas can make quite the difference. Here are a couple DIYs that are easy and inexpensive to make. 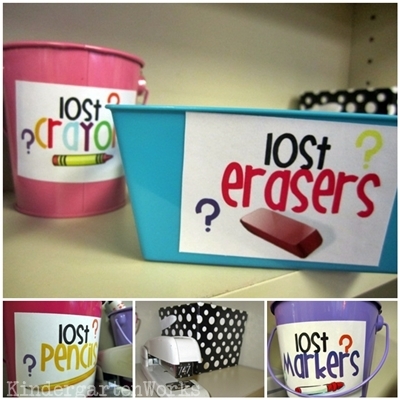 Creating a designated space for all the “lost things” found on the floor can be quite a time saver in a busy classroom. Blogger Leslie, of kindergartworks.com shares a great solution for this daily classroom happening. In her blog, you can download free labels that have, “lost pencils,” “lost erasers,” “lost crayon,”…well you get the idea. The labels can then be put on cute containers you can purchase in the $1 bin at Target. This way, students know automatically, without having to go the teacher, where to put items they find on the floor. Students can also go straight to these containers if they ever need or lost an item. Take any picture frame that can be purchased at a Dollar Tree store and paint it any color your want. (If you’ve become the Pinterest-crazed teacher, I’m sure you have a color theme to your classroom.) Use scrapbook paper or fabric as the background and glue on a class list. The list goes into the frame and voila! 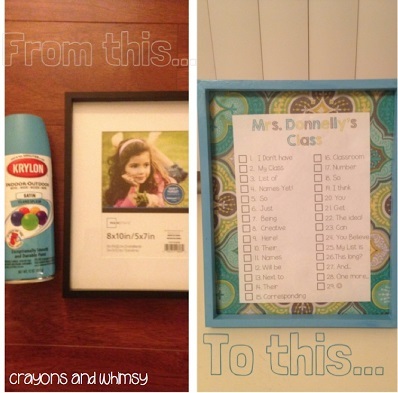 A very eco-friendly class list that can be utilized in many ways. When you call students to the back table for craft projects, you can check off their names when they are done. This list can be used for homework, for permission slips, or anything else you need to keep track of students. I suggest actually making 2-3 of these to use. Christy explains this DIY in full detail in her blog. Wishing teachers everywhere, a fantastic school year! Thank you for cramming 365 days of knowledge into 180 days.